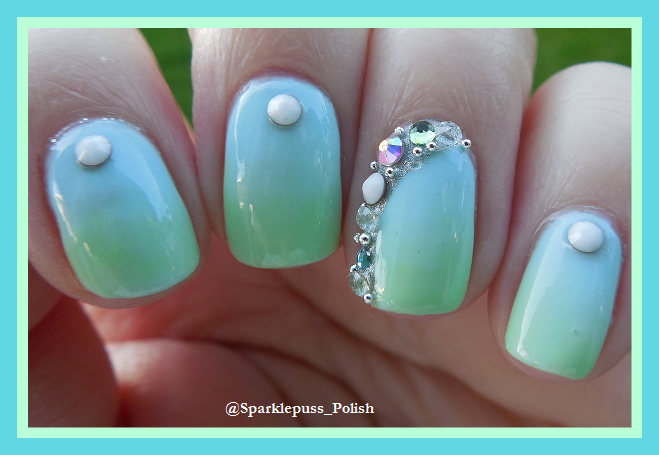 Pearl Jammin’ with Beach Nail Art! Hello, everyone! It’s the start of a new week and I am still in Virginia visiting my BFF and her family, so I got this post ready to go ahead of time! Today I have some beach nail art to show you. Beach theme is my favorite kind of nail art to do because there are so many options! Today’s art is shown over China Glaze’s Pearl Jammin’. So for this I used 3 coats of Pearl Jammin’. Flooded my cuticles a bit, but it didn’t surprise me. I’ve been spoiled by the amazing formulae of indie polishes. The color is so beautiful, though, that it’s worth the hassle. Now, because I was about to go to Virginia, I wanted my nails to last the whole time- approximately 6 days. I decided to try doing a gel mani. I did a gel base coat, gel topcoat, added doodads, then did another top coat of gel. The next day, my entire left thumb had popped off the nail. I was so ticked. I ended up peeling the whole thing off. What a major dud this turned out to be. womp womp. I should have just stuck to regular base and top coat! I ended up doing another mani the night this one went bust. I’ll be showing you all that later in the week. I kick myself daily for missing out on this polish. I got it on Amazon. I had zero dollars when it came out! This is so delicate! You have some of the prettiest color combos + decorations. I’m so sad I didn’t pick this one up. It’s so beautiful! Yeah, this polish is a must have! This is so pretty! Sorry it popped off too quickly. Yeah, that was a major bummer. Pearl Jammin’ is one of my favorites!! Love this mani!